Join the discussion on our forums! 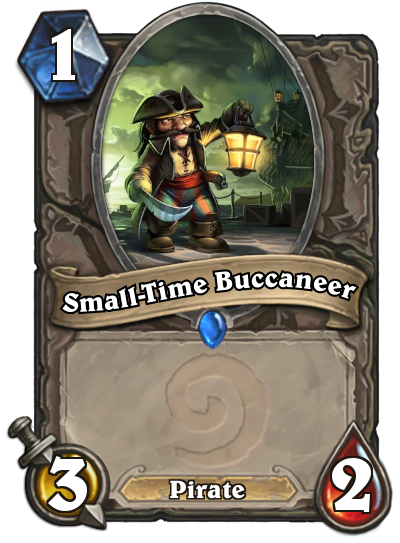 Come discuss Small-Time Buccaneer over in our dedicated Small-Time Buccaneer discussion topic. "Oh, I'm not serious about it. I only pirate on the weekends." Dat golden animation is so long. Good question. I still think it's usable since it's early game for Pirate decks, but if you don't like playing Pirates then go right ahead. After all it's just a Rare. now it dies to patches very good nerf. More like One-Ping Buccaneer now. At last. 1 mana 4/3 that deals 1 damage to face! you forgot charge. yet there is one card that makes control tremble in fear. 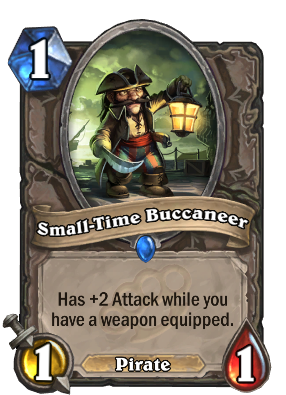 thats right kids, it's small time buccaneer. Please just nerf this. I'm having a salty morning but am tired of games being decided by turn two. Like full nerf, right out of the game. Has +1 Attack when you have a weapon equipped? Entry clip should have been "Yarr, I'll get right on it!" You forgot "Battlecry: summon a 1/1 Pirate with Charge".